An amplitude calibration was carried out on the spectrograph, which showed that a change of 5 dB was represented by a change in th length of the marking line ranging betweeen 5.2 and 7.5 millimetres (over 28 readings), wth a mean of 6.37 mm. A factor of 0.07852 was fixed and used to convert amplitude measurements (in hundredths of a centimetre on the measuring paper) into decibels. The spectrograph was so set up as to accent the higher frequencies by a weighting of 9 dB per octave with respect to 1 kc/s. It was therefore necessary in calculating amplitudes to allow for this weighting. It was not, however, practicable to correct each individual formant amplitude measurement by reference in every instance to the frequency concerned. Instead, the uncorrected mean amplitude for each formant was calculated, and then this mean corrected by reference to the mean frequency of the vowel formant concerned. The procedure was as follows. It was found that the formant with the greatest uncorrected amplitude (that is, the formant with generally the longest marking line on the spectrogram section) was the F2 of /æ/. 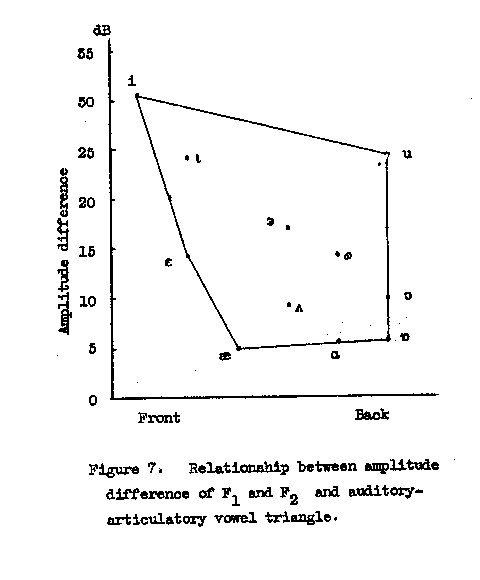 So that the amplitudes for different speakers' vowels should be comparable, all formant amplitude figures were subtracted from the average of the two F2's of /æ/ from the speaker concerned. The resultant figures were then averaged by vowels and formants. From each mean thus established, if the frequency mean for the vowel formant concerned was above 1 kc/s, an amount was subtracted to compensate for the analysis weighting; if the frequency mean was under 1 kc/s, an amount was added. The amounts to be added or subtracted were read off a graph of frequency versus correction amount: since the graph was on log-linear graph paper, 9 dB per octave weighting was represented by a straight line. Next, the figures were converted into decibels; and finally the decibel amounts were related to the amplitude of the F1 of /ɔ/. Results are tabulated in Table 5 and illustrated in fig. 6. The spectrograph does not enable one to measure directly the amplitude of a formant, but only the amplitude of its loudest harmonic. This means that the amplitude figures for a given formant vary widely, and no very great degree of accuracy is possible in the determination of formant amplitudes. In view of this consideration, it is not felt that the wrighting-compensation procedure outlined above can reasonably be objected to. The amplitude readings from one subject's pronunciation were rejected as unusable. Two other subjects' pronunciations had been analysed without any frequency/amplitude weighting: this was allowed for in the amplitude calculations, but the F3 amplitude readings were unusable. 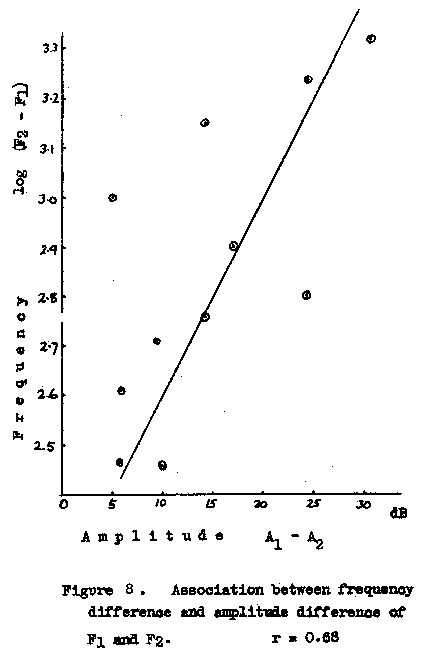 The relative amplitude figures given, therefore, are based upon the pronunciation of 24 speakers (F1 and F2) or 22 speakers (F3). Where F3 failed to come up in the spectrogram section (and its frequency therefore had to be measured from the frequency/time display), its amplitude was taken as zero with respect to the amplitude baseline, although certainly its amplitude would in fact be somewhere below zero. This means that some of the quoted F3 relative amplitude figurs may err on the generous side: F3 may be of rather less mean relative amplitude than stated, particularly in the case of /ɔ/ and /u/, the vowels whose F3's most frequently failed to come up in the spectrogram sections. As, it seems, with most acoustic vowel parameters, it is possible to manipulate the figures in such a way as to show correlation with tongue height and yield an acoustic triangle similar to the familiar auditory-articulatory triangle -- in this case by plotting as the ordinate the difference in amplitude between F1 and F2, with the abscissa arbitrarily arranged to bring out the similarity (fig. 7). In other words, high tongue position corresponds to an F2 of much less intensity than F1, while low tongue position corresponds to an F2 of intensity similar to that of F1. As far as /ʌ/ is concerned, this amplitude triangle gives a better positioning (that is, a positioning more like the auditory-articulatory positioning) than any other acoustic plot, not excluding the frequency plot of F1 versus F2. In fig. 8 the difference in mean amplitude between the first and second formants for each vowel is plotted against the logarithm of the mean difference in frequency. It will be seen that there is a positive correlation between the two, though not of a particularly high order (r = 0.68) [32, p.286]. The closest similarity between Gen.Am. and RP is for /E/, where the figures are virtually identical; the greatest discrepancy, as expected, is in the F3 of /ɜ/ (Gen.Am. /ɝ/). An unexpected feature of the RP figures is the comparatively great amplitude found for F1 of /ɩ ɷ u/. As was the case with frequency, so also with amplitudes there is greater similarity between Gen.Am. /ɔ/ and RP /ɒ/ than between Gen.Am. /ɔ/ and RP /ɔ/, which latter has a particularly low-amplitude F3.